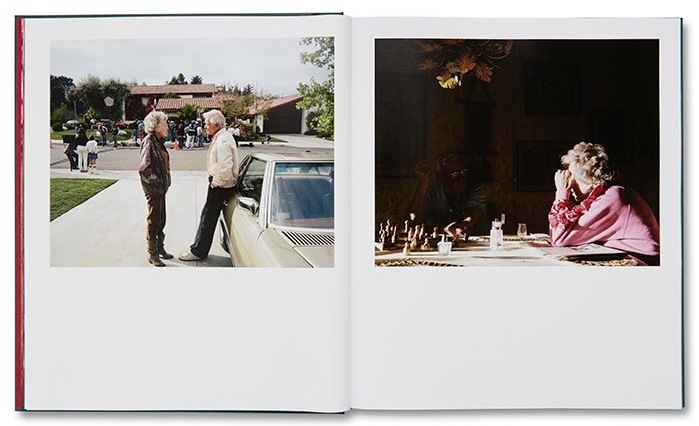 Book Review Pictures from Home By Larry Sultan Reviewed by Blake Andrews Sultan once described his work as "taking the construction of the domestic and looking at it as a theatrical subject." Not only is he aware that his photographs involve a degree of artifice; he uses it to his advantage. 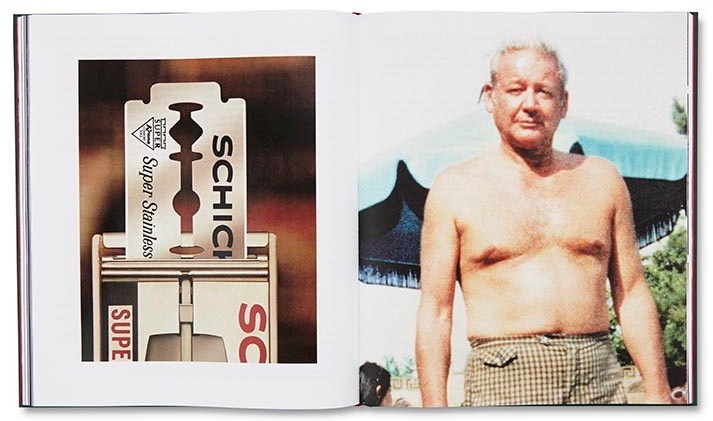 Pictures from Home Photographs by Larry Sultan. Mack, 2017. Mack, London, England, 2017. 264 pp., 140 color illustrations, 9x10¾". 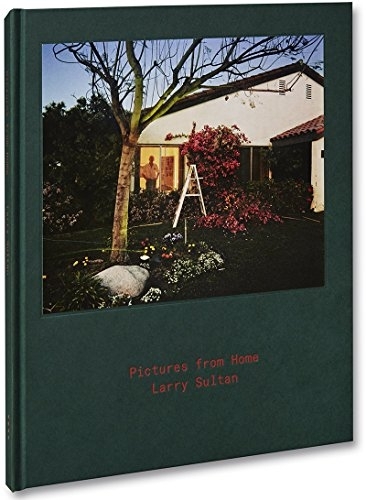 A quarter century has passed since Larry Sultan's Pictures from Home was published in 1992, plenty of time for its photographs to seep into the canon. Most fine art photographers, including myself, have absorbed them by now. Close your eyes and concentrate, and I bet you can probably bring any of several to mind. The photograph of Sultan's mother leaning against a green wall, his father watching a Dodgers game nearby, for example. Or the shot of his father practicing his statuesque golf swing indoors. 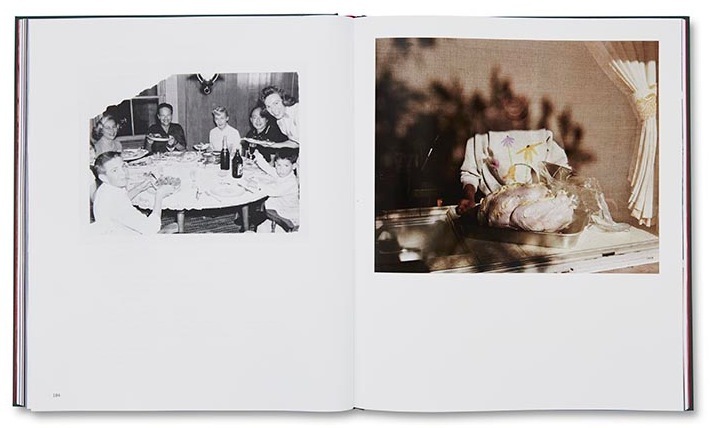 Or the eerie photo of his mother holding a buttered turkey behind a dimly lit screen door. For twenty-five years these images have represented the gold standard not just of family photography, but color documentary work in general. 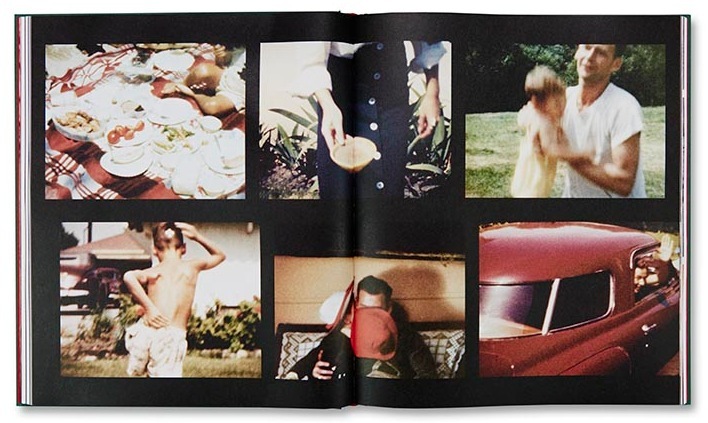 The original edition of Pictures from Home has fallen out of print and a used copy will now set you back a few hundred dollars. I've never seen it in person. Still, I'd foolishly persisted in forming a mental image of the book. I imagined it might be like other fine photo books of the era featuring nice color photographs, perhaps one or two per page, spiced up with some text. Maybe there was a foreword by a respected critic. 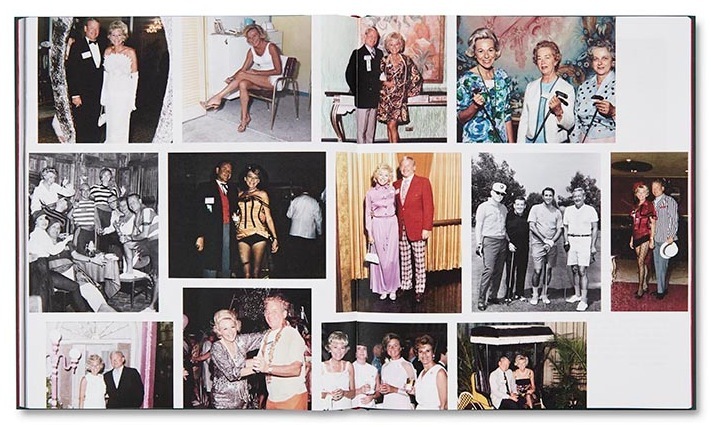 It was a photobook, and the photos would take center stage. This is the book I'd been expecting when Mack's newly revised and expanded edition arrived. But after just a few minutes with the book, it became apparent that it wasn't this at all. Pictures From Home isn't a collection of photographs. Or rather, it isn't only that. Instead, it's a general account of middle-class domestic life in post-war America. Sultan's photos play a supporting role, but a good chunk of the book is comprised of text, not images. These written accounts — verbatim transcriptions mostly — muse on a range of topics including portrait photography, self-analysis, office politics, retirement, and more. Throw in a healthy dose of old home movie snippets, memorabilia, snapshots, and you've got Pictures from Home. The part that I'd imagined might be most prominent — Sultan's photos, you remember, which had seeped into my brain as well as the canon— come in small scattered bursts, two photos here, another four there, spicing up the book but never dominating. So my initial encounter was a surprise, but after it had quickly worn off I found myself sucked into the Sultans' story, as captivating as any good novel. Pictures from Home tells the story of Sultan's parents, Irving and Jean, as they follow the American Dream. Although the text is written from a first-person perspective, it speaks in three separate voices —unlabeled yet easily distinguished. Perhaps this is a nod to Faulkner, as authorship alternates between Irving, Jean, and Larry. In interview excerpts, we read about Jean and Irving's courtship, marriage, religion, family, career, and migration to the promised land of California's San Fernando Valley. Considering Larry Sultan's eloquence — Alec Soth once stated "Has there ever been a photographer who writes better than Sultan?" — I suppose it's no surprise he comes from articulate stock. His parents are exceptionally candid and self-aware. 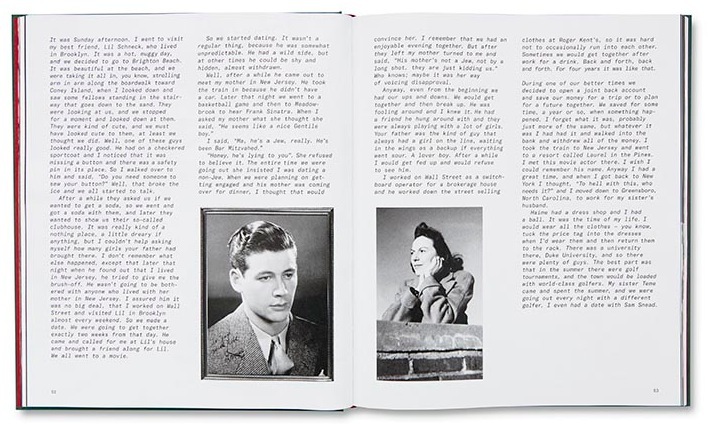 When taken in combination with historical ephemera, their written narrative describes their family history better than any scrapbook or journal. The reader feels a level of intimacy, which is slightly discomfiting. Larry grows up a well-adjusted boomer, goes to art school, and eventually returns to photograph his parents in the 1980s. By this time the Sultans are empty nesters, aging into their golden years in a suburban home still boasting chintzy ‘60s decor and beautifully landscaped patio. His old digs create an ideal, verdant backdrop for the theatrical version of his parents he hopes to photograph. The Hollywood director in Larry comes out as he stages his parents amid various suburban tableaux. Some of Sultan's photographic ideas: Dad looking like Johnny Carson, Walking the dog at night, Mom opening up curtain, Shaking hands, etc. These are from a list included in the book, most of which he seems to have been checked off. No matter the photo, Sultan imbues his scenes with a quiet sense of ironic detachment. Irving and Jean are the only subjects; their private settings the only backgrounds. Like any good baby boomer, Sultan has found the soft underbelly of his elders — and poked it hard. It helps that Sultan’s parents are straight out of Greatest Generation central casting. His father wears a polo shirt or dinner jacket like a second skin; his mother more comfortable in disco/leisure outfits. Both boast magazine-ad hairstyles and blank expressions. To learn that Irving Sultan was a razor company executive who studied Dale Carnegie, and Jean was a successful realtor who almost defies credulity. Sultan once described his work as "taking the construction of the domestic and looking at it as a theatrical subject." 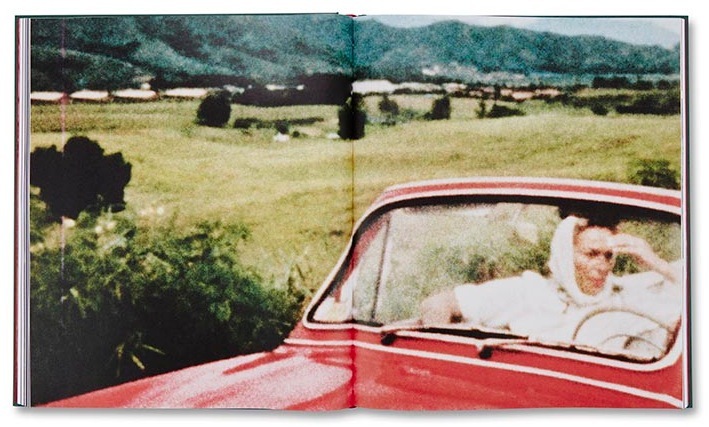 Not only is he aware that his photographs involve a degree of artifice; he uses it to his advantage. In interviews with his parents, he presses the topic of photography. How do they like being photographed? What do they think of his portraits? What are their ideas about his project, or his art career, or their relationship? Irving and Jean speak openly on all these topics alongside Larry himself, all transcribed candidly. Their comments are remarkable, revelatory, and honest. Gregory Halpern nails it: "One of the most incredible things about Pictures from Home is how vulnerable Sultan allows himself to be in the text, in which he confronts insecurities about himself and his work, brilliantly deconstructing the project and the challenges of making it." A good example is Jean's reaction to Larry's real estate portrait. Rarely has the dichotomy between art and commercial requirements been so simply galvanized. Jean wants a smiling bestseller, but instead, Larry gives her a bland mugshot. It embarrasses her so much she won't tell her friends who took it, a reaction that would give most photographers pause. 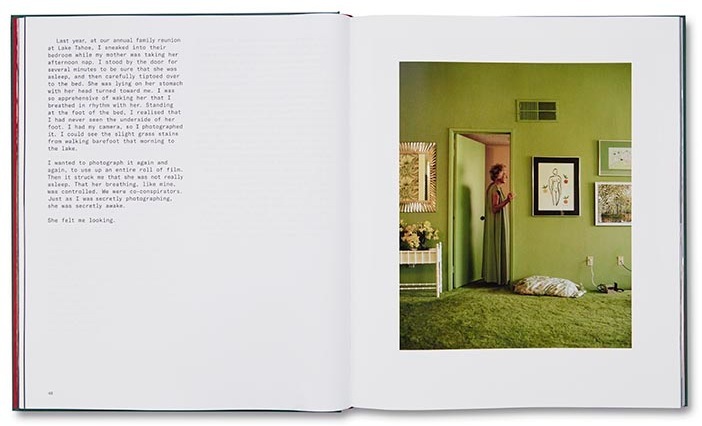 But Larry Sultan not only embraces it, he incorporates it seamlessly into her story. She writes about the picture, he comments on her thoughts, and so on. Similar disagreements arise throughout the text, and he calmly records them all, making Pictures from Home a master class in photo ethics. From what I can tell, the Mack version is very similar to the original with a few exceptions. Mack mentions that "the Super-8 film stills have been newly digitized and magnified, with select scenes running full-bleed across double-page spreads." There are some other noticeable differences. The cover photo is now uncropped. The book's exterior has been kept green as an homage to Sultan's emerald palette, and the dimensions are roughly the same size as before. But the whole enterprise has been twisted ninety degrees from landscape to vertical format, giving the interior photos a wider berth. The gatefolds of the earlier edition have been removed, and the page count boosted by more than half, from 128 to 196 pages. The strange, ‘80s computer-style typeface is unchanged. Perhaps there are other changes, but let's just say the 2017 edition leaves nothing wanting.